So you and your fiance have just gotten engaged. CONGRATULATIONS!!!! This is going to be a very exciting time in your life. Once you have told your parents, the next thing you should do is look into hiring a wedding planner. Whether you have an unlimited budget or a tight budget you should hire a wedding planner. For the super busy person, you should consider hiring a full service planner. Typically this person will have contacts with almost every aspect of a wedding and in some cases can get you a discount. If you like to be creative and make things, you might consider hiring a coordinator to help you with the final details and orchestrate your creation from the rehearsal to the day of the wedding so you can enjoy your wedding and reception. This type of coordinator could be called the day of coordinator, however the planner needs to come in about 2-3 weeks prior to the rehearsal to help finalize details, help create timelines, and help you make sure all details have been addressed. Again this person might be able to get you discounts but they can also help bring your dream wedding to fruition and help you to feel like a guest at your wedding. 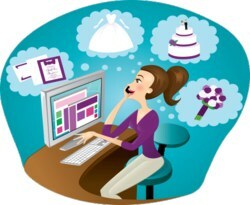 Make sure you check references for any wedding professional, this includes wedding planners. Our goal as a wedding planner is to help our bride and fiance visualize their first party as a newly married couple and create an atmosphere where they can be a guest at their own wedding and reception. You can search for wedding planners from Associations such as ABC (Association of Bridal Consultants).